We are pleased to announce that NEURODOME will be coming to the East Village Planetarium at the Lower Eastside Girls Club! Founded in 1996 to address the historic lack of services available to girls and young women on the Lower East Side, the Club offers programs in arts, science and technology, health and wellness, literacy, and civic engagement to help girls discover their individual skills and passions and to assist in developing these interests to their full potential. They are now opening an amazing new facility which we visited recently. 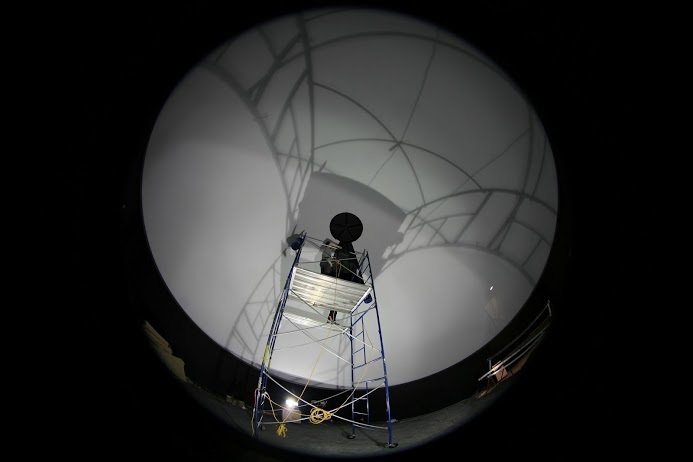 In addition to a fully operational bioimaging facility, the Club is putting the finishing touches on their very own digital dome theater (image via Google+). Upon completion of our animations, theirs will be one venue at which we will screen our wares. In other news, just two more weeks to go on our Kickstarter campaign! Freedom ain’t free, and neither are planetarium shows – so now is the time to pitch in! We’re 71% of the way there toward our $25K goal, and we have 335 backers. Again, Kickstarter is an all-or-nothing platform – if we don’t reach our funding goal in pledges, we get none of the funds. We’d like to avoid that scenario!